Given that Bryn has the power to elevate a cup of coffee into a figurative poem—and that French press is usually characterized not by clarity, but by viscosity—we were eager to learn more. Outside of espresso, brew methods are loosely classified into one of two categories: full immersion or filter. Techniques that rely on a filter, like pour over or Chemex, remove much of the coffee bean’s cellulose to make a delicate and articulate coffee. The French press, on the other hand, a popular method since the mid-1900s, falls into the immersion category. It yields a full-bodied extraction that includes more of the indissoluble parts of the coffee grounds. Admirers love French press for the coffee’s rich mouthfeel, while detractors find it full of sediment or prone to bitterness. Bryn, inspired by the coffee writer, James Hoffman, began experimenting a few years ago with the French press technique, manipulating the variables of grind size, time, and brew ratio so that it more closely mimicked the cupping bowl. Cupping is not a common practice at home; rather, it’s the industry’s method of evaluating coffee. Grounds are placed in a small vessel, to which near-boiling water is added. The mixture sits for several minutes before the “crust” of coffee floating on the top is broken with a spoon, when then sinks to the bottom of the cup. It, too, is an immersion method, but minimal agitation yields a coffee that’s expressive and clear. Could the French press, Bryn wondered, be used in such a way? Below you'll find the brew guide for this method, but there are no hard-and-fast rules. Find the right grind size. Part of the process in a French press is a settling of the coffee at the bottom of the glass vessel, where water is unable to make even contact with all of the grounds. 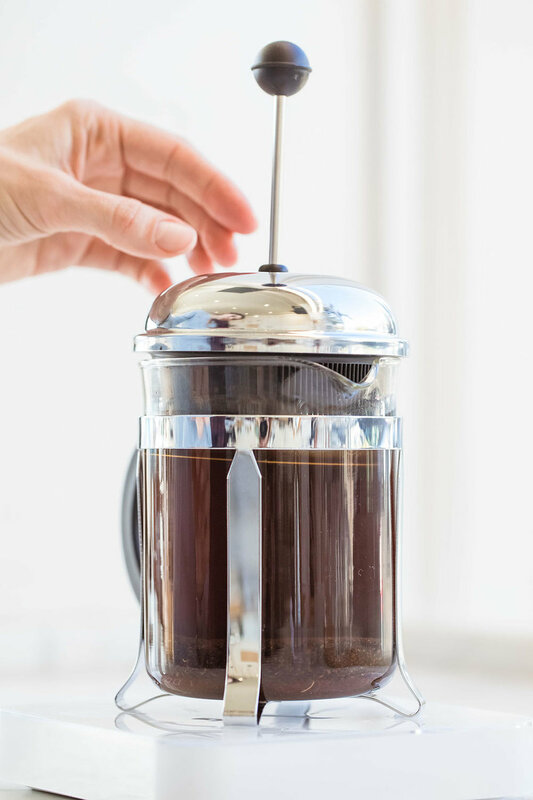 To compensate, grind the coffee slightly finer than is typically recommended for French press—coarser than for a pour over, but only slightly so. This is a fifteen-minute process, so minimizing heat loss ensures a more even extraction. In addition to time, brew ratio is the other variable used to develop body and flavor. We find that a 1:15 brew ratio is a great starting point. For a four-cup French press, that’s 38 grams of coffee and 600 grams of water. Empty the press pot of hot water and add the coffee. Have a timer ready and press start when you begin to add water. This is a two-phase pour. Begin the first in a spiral motion and stop as soon as the grounds are fully saturated. Begin again, pouring in a steady and quick stream, so that as the water rises, it uplifts the grounds. Stop pouring when you’ve added 600 grams total. Don't worry about getting your technique just right; the coffee will likely rise regardless, due to carbon dioxide trapped in the grounds. Let the coffee sit, uncovered. At four minutes, break the crust. Use one or both of the spoons to gently break the crust. Push the coffee grounds gently to the opposite rim of the glass. The motion will propel many of the grounds to fall slowly below the surface, eventually sinking to the bottom. Have a soft touch, so that agitation is minimal and the extraction more even. A light and foamy film will remain. Like the crema on top of espresso, it’s a combination of emulsified oils, sugars, and proteins. Remove and discard with one or both of the spoons. Let the coffee continue to sit, uncovered. At ten minutes, notice the speckles forming on the surface of the coffee. These are brew colloids: the suspension of oil and sediment in coffee. Similar to the combination of dust and water vapor that forms clouds, brew colloids are present in all brewed coffee and contribute texture and flavor. Immersion methods, like French press, retain more colloids than pour overs—and instant coffees possess none at all. At thirteen minutes, place the lid on top of the pot. Have two preheated cups ready. Without plunging, pour the coffee into two cups. Only lower the lid enough to rest on top of the coffee. Because the coffee is made with all parts of the grounds, it is more stable as it cools. Bryn likes to sip his slowly, on a weekend morning, when he has the time and wherewithal to bear witness to a coffee that’s lost nothing and shows everything. Blends or single origins work equally well for this method. Bryn likes how coffee from East Africa becomes more integrated, where the characteristic bright acids find, in his words, "a middle tone." Coffee from Colombia also does well, for the time and expansion allowed in this method develops its inherent richness.